Gather 'round and dig in! 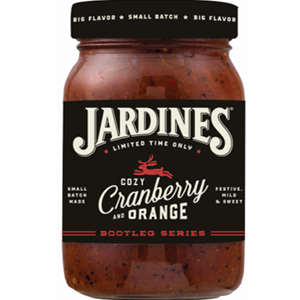 Jardine's Cozy Cranberry and Orange salsa blends crisp cranberries and juicy oranges for a cornucopia of sweet, juicy flavor- just one more thing to be thankful for this season! Tomatoes,Tomato Juice, Sugar, Water,Fresh Oranges,Cranberries, Fresh Jalapeno Peppers, Salt,Distilled White Vinegar, Fresh Garlic,Contains 2% or less of spice.